Your ear consists of three parts: an outer, middle and inner ear. The middle eardrum has a tube extending from it called the Eustachian tube that normally has a small amount of mucus inside. However, fluid drainage from other parts of the head, such as the nose, can lead to fluid buildup in this compartment. This occurrence can be caused by a number of viruses or even ear deformities that complicate your condition. Rhinovirus is a type of virus that typically is transmitted through air particles, such as when a person with a rhinovirus sneezes. When you breathe in these air particles, you can become infected as well. The virus typically begins when the nose becomes filled with fluid, creating pressure and causing a runny or stopped-up nose. Because the Eustachian tube of the middle ear connects to the back of the throat, the fluid buildup from the rhinovirus can fill this tube as well. This signifies a condition known as otitis media with effusion. The result can be difficulty hearing or a noise in the ear that sounds like ocean waves or running water. Itching at the ears may also occur. Pain is not typical of this infection type, and the infection typically heals on its own. However, the fluid and pressure may be present for a month or longer, according to the Centers for Disease Control and Prevention. When the ear becomes infected with the influenza virus, a condition known as acute otitis media results in a fluid buildup and pressure in the ear that can cause pain, fever, redness at the ear and pus drainage. 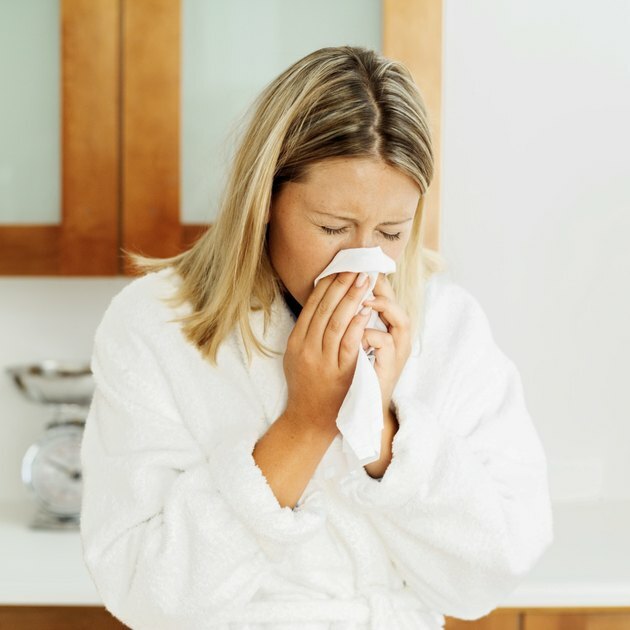 This condition differs from a rhinovirus because rhinoviruses typically do not cause pain in addition to pressure, according to the Centers for Disease Control and Prevention. While viruses cause both colds and flu, the influenza virus is more serious because it infects the respiratory system and joints, in addition to the ear canal. While a cold or flu virus can cause fluid to build up, a Eustachian tube deformity can further complicate pressure and fluid buildup, extending recovery time. When performing correctly, the Eustachian tubes open and close when you sneeze, swallow or yawn, according to the American Academy of Family Physicians. However, if the Eustachian tubes do not work correctly, the tubes can become plugged easily. When viruses create excess mucus in the body, your tubes may not open and close correctly. Children are especially prone to this dysfunction type because they do not have fully formed tubes -- their tubes tend to be shorter and straightened, making the pathway more accommodating for viruses. Smoking can damage the cilia that move mucus away from the Eustachian tubes, causing dysfunction. Obesity also can cause fatty deposits to build up around the Eustachian tubes, resulting in drainage difficulties. NetDoctor: Is My Ear Problem Due to Flu? How Long Can Fluid in Ears Last?